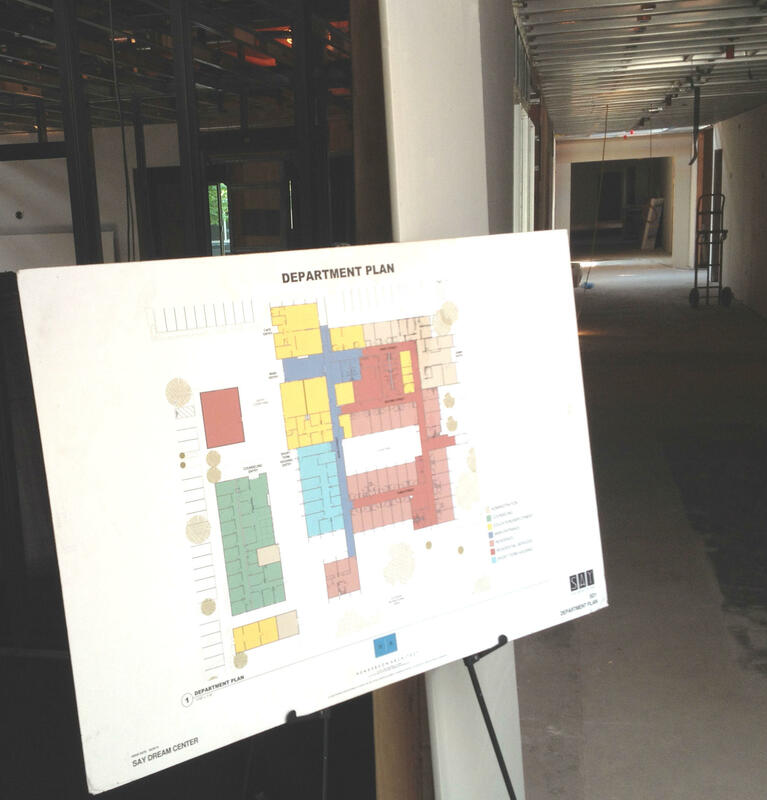 Visitors touring the work-in-progress Dream Center are greeted with a color-coded floor plan for the new facility, before heading down an unlit hallway. On the outside, the new main entrance is taking shape, on the building's west wall--180 degrees from the former main entry, which will now access the SAY administrative offices. 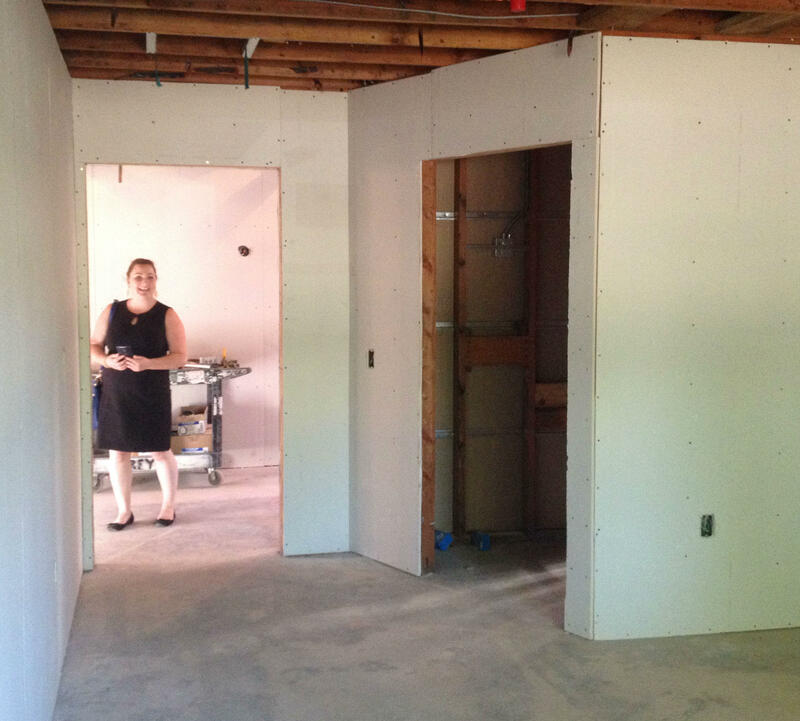 SAY's Communications Director, Caitlin Childs, inspects a future residential room at the agency's emerging Dream Center in southeast Santa Rosa. The complex transformation of a former hospital into a residential and support center for homeless youth is well underway. Parent organization Social Advocates for Youth is offering occasional tours of the facility in transition. After visiting the site this week, KRCB’s Bruce Robinson filed this update. It's still a bustling construction site, but the future is coming into focus at the new Dream Center. 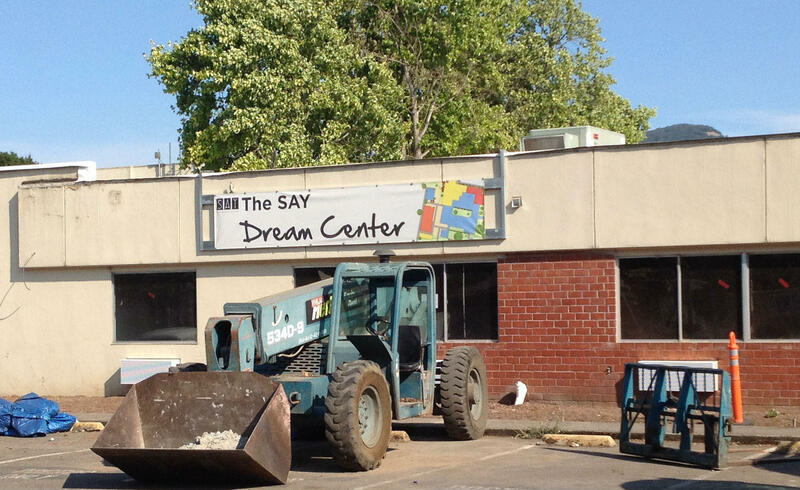 The first priority for SAY right now is to be able to open the doors of the Dream Center. Communications Manager Caitlin Childs says that will also allow the first group of residents to help shape some of the final details at the new facility. Those rooms that don’t look out onto the courtyard may instead see an expanse of lawn transformed into a community garden, one of several ways that Ceres Project Executive Director Cathryn Couch sees her organization meshing there with SAY. The SAY Dream Center, a new housing and service center for homeless youth in Santa Rosa’s Bennett Valley, has been controversial in the neighborhood around the former Warrack Hospital site. But it received unanimous support from the city’s Planning Commission two months ago, and further undivided backing from the Santa Rosa City Council last night. To find out what happens next, KRCB’s Bruce Robinson spoke with the man behind the project.